I am not done with Honduras yet, but the dragonflies are finally coming out in our cold water ponds here in Southern Maine, and I could not resist posting this shot of a Chalk-fronted Corporal and a Frosted Whiteface sharing a close perch. They contested this branch along the edge of the pond for 10 minutes as I watched them, and other Odonata in the area. If the Corporal had the perch alone, the Whiteface soon drove him off, and vice-versa, but often they compromised and both used the perch. Generally they were a foot apart…but this once they were practically on top of each other. Makes a good comparison shot of the two species. 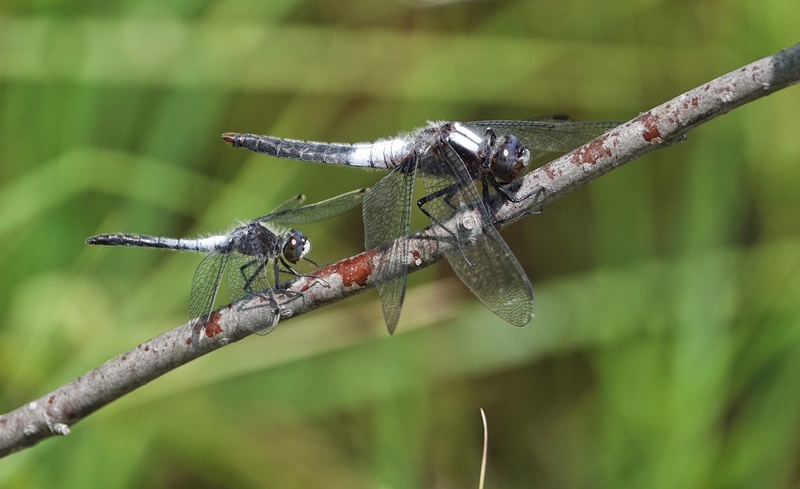 There were many of each species along the pond edge, as well as few Slaty-Skimmers, Unicorn Clubtails, and Calico Pennants…all early flyers here in Southern Maine. Sony RX10iv at 600mm. Program mode. 1/500th @ f4 @ ISO 125. Processed in Polarr.